I love, love, love the guard dog picture. We have a boxer and that is so their personality. Except that he is an excellent guard dog when he needs to be. 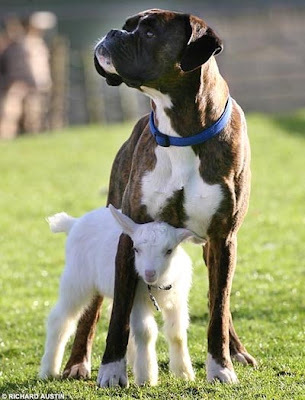 Boxers are really protective of their families. But I wouldn't let a boxer stay outside year round. They don't like the heat. When I would put Stat, our dog, out in the summer he would come in just after a few minutes panting and breathing so hard. Not that I don't think dog can't be outside, but just not boxers. Besides I can't resist sad puppy eyes, so Stat is an inside dog for sure. Oh yeah, and that is really crappy about being robbed! I can not believe that! what did they take and what time of day was this? that is horrible!!! As for big dogs, I thought I wasn't much of a big dog person until I was forced to bring robs lab home from his parents house but now we have another one. so... I really do like them I just have to do fur duty once a week. Johnna you will absolutely love potty training a bigger dog, they catch on so much faster b/c they mature faster than say... a mose(:! marlee was trained after 2 weeks with a doggy door. I would not keep any dog outside year round here it is so hot, I would feel horrible. My personal opinion is that I don't know how effective it will be to have a guard dog. A friend of ours family was robbed and they had 2 HUGE dogs. The dogs didn't even bark and I would assume that most robbers don't leave just because there is a dog in the house. It might just depend on the dog though. I would get a security system first before I would rely on a dog to protect your house. We have a security system and an English bulldog and I feel more secure with our alarm. Our dog doesn't bark ever. Just my opinion though. Good luck. I'm sorry to hear about your house too! That is terrible! When My family lived in Mesa we had 2 golden retrivers not exactly gaurd dogs but they where deffinitly out door dogs. they didn't get to come inside very often. I remember there being alot of tick control. Our dogs had shelter where they could go and get out of the direct sun light they always had planty of water and I have discovered here that when it's hot alot of dogs enjoy a kiddie pool. Really do your reserch on breeds before getting a "gaurd dog" some breeds are better than others for gaurding and they often need good traininng, that is easy to do as long as you start at a young age and don't let up till thier older. I'm sorry to hear about th robbery I hope they didn't get much. I don't much like living in the city becouse of all the dangers but between all of James' guns and military training and Cowgirl always on gaurd for intruders (she will bark her head off in your face but wont bite) I feel safer. We always know if someone is getting too close to the apt becouse we will hear her growl the closer they get the louder she is. HOly Crap! Scary! I'm so sorry! I"d get a guard dog too, but I like big doggies. We always let ours inside for a few hours everyday during the summer, it's just too stinkin hot here. good luck with that! Oh I am so sorry! I hope that you two will have some better luck coming your way! I'd feel bad making one dog stay outside year around and your other one inside...that would probably kill ya from guilt! The heat is horrible too, my parents have an outside only dog, but they let him in the garage during the hottest part with a swamp cooler! First of all that's seriously messed up about the breakin and robbing. About the dogs...this is Marsh giving advice here...I am not a dog person...my wife is...however i'm becoming a converted dog person. We have a boxer/lab mix and then a golden retriever. The golden is amazing around kids/families. The boxer is fun loving too, but can be a bit overbearing with the kids. When our golden eats...the boxer sits on the lookout and just watches to make sure it's safe...random boxer instinct...definite protector...so I'd say giddy up with a boxer if your looking for protection...we have a kiddie pool and they are outside 24/7 and love it. They don't know any difference since that's how we've had them since we first got them. During a storm we brought them indoors...they freaked out...they'd rather be in the storm...so we sent them back out and they were good to go...dog kennels are cheap at lowes if you go that route...just be aware they will chew up anything you have in your backyard! I'm stealing your christmas countdown tree...it's super cute!